Whether you’re looking to complete your Christmas Santa costume, or simply want to store your holiday gifts effectively, The Christmas warehouse offers a collection of decorated gift sacks to suit your needs. As the perfect accessory to your home gift giving, these holiday gift holder bags allow your family members to delight in the process of removed wrapped gifts and distributing them to the appropriate recipients. If you’re travelling to see friends and family, the Santa sack is equal parts functionality and festivity. Simply load your gifts gently into the sack, cinch the top, and load your cheerful haul into your car. When you arrive at your destination, your loved ones will delight at seeing you carry the gift sack filled with presents and treats. For long - held holiday traditions or an exciting new addition to your Christmas routine, the Santa sack is a fun and useful to store or transport gifts. If you or someone you love plans to dress up like Santa for the holidays, no Kris Kringle costume is complete unless you have a decorated holiday bag brimming with gifts. 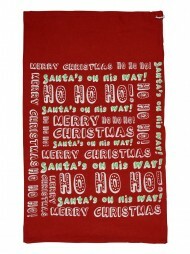 Sling this festive gift sack over your shoulder and you’ll instantly complete the look of your Santa costume. Persuade young ones that you’re the real thing by delivering their gifts in this magical holiday gift bag. With plenty of capacity for all of your holiday presents, these gift bags can store Christmas surprises for your whole family. Instead of placing each gift individually beneath the tree, reduce your risk of getting caught sneaking around by loading all your pre - wrapped presents into the Santa sack and tuck it gently beneath the tree for a whimsical Christmas morning experience. Tell your young family members that Santa delivered exactly what they wanted and watch as they open the sack of holiday gifts, removing each magically wrapped package one at a time. Your choice of designs includes felt applique text and character graphics or more traditional decorated canvas. Each sack features drawstring ties to ensure proper closure of your bag and prevent gift spillage. Choose between simple I - cord closure or a tasselled closure pull for added decoration. Felt cut - out applique adds dimension and depth to the design while showing your favourite holiday characters and sayings. The sturdy woven construction of felt fabric makes it a wise choice for decorating bags that must stand up to a day of holiday wear and tear. While its thick woven fibres are tough, they are also soft to the touch and safe for young hands or sensitive skin. Felt is a common choice for cut - out graphic appliques, as it holds its shape and does not fray over time. Its lightweight design and soft, durable fibre make felt a wise choice for transporting heavy holiday goods with sharp corners and edges. Canvas holiday gift sacks offer a more traditional Santa vibe, and offer many of the same benefits in durability. Durable woven burlap threads help cradle your gifts and prevent rips or tearing while transporting your gifts from house to house. Canvas sacks cinch closed and reliably protect your gifts from falling out in your car (sleigh) or on the way to your destination. Canvas also works well with fun printed decals to remind your recipients to enjoy the cheer of the Christmas season. 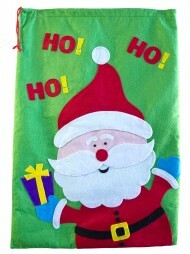 Keep your precious holiday presents clean, intact, and ready for gifting with a durable and festive Santa sack. Playful reminders like “Do Not Open Until Christmas” will help build excitement and anticipation for the holidays while protecting your gifts from early season snooping. Fun felt applique details capture favourite holiday characters and bring joy to your yearly traditions. Add a realistic touch to your Santa costume, or simply bring the joy of the season to your family’s gift - opening routine with these exciting and festive gift sacks.